I looked up from my reading and realized that I was in a room with a urinal. This was a bit disconcerting, to say the least. I have a kidney stone. This, in and of itself, is not a problem. However, the fact that the kidney stone is traveling through my renal system is a problem; a rather painful, pesky problem. I went to see my doctor, who sent me to the CT scan people and then to the Urologist. 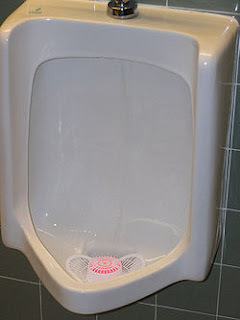 When I saw the urinal on the exam room wall, for a brief second, I panicked thinking I was back in elementary school and had accidentally slipped into the wrong room. Between the urinal, the posters on the wall, and the fact that the exam table didn't even have stirrups, I felt very much out of place. We get used to the way things ought to be. When I am stressed, in pain and crabby, I don't want unfamiliar surroundings; I want the comfort of a familiar exam room and a familiar face. However, my regular health care provider does not have expertise in this area, so I find myself in a different world. As long as no one expects me to actually use the urinal, I think I am okay. My kidney stone is in the wrong place, too. As long as it was hanging out in my kidneys things were fine. Now that it has decided to move to a new location, there is a disruption of all things familiar. It is a solid traveling in a world made for liquids. Funny, how that one difference can cause so much mayhem. Many times during my weekly routine as a university instructor/ graduate student, I feel like I am in the wrong room. Not just the wrong classroom, or the wrong building, but the wrong life. If I had a nickel dollar for every time I said "what was I thinking?" regarding my decision to enroll in this program, I would have paid my tuition AND fees AND had some left over to cover the cost of textbooks. Like my kidney stone, I am a solid on a campus full of liquids. I feel like I am the only one who can't understand the statistics, who confuses vocabulary, or who wants to hand in a reflection paper titled "Huh?" I am too old, too tired, and too slow to learn much of what is around me. I love teaching my undergrad students but even in that class I worry someone will ask me a question I can't answer. It is as if my entire world is full of rooms with urinals and I am in a desperate search for a room with stalls. I gotta quit talking about bathrooms. No really, I have had at least 2 liters of water today. It is strange to think that because we are in the world but directed to not be of the world, that God created us to be perpetual aliens; strangers in a strange world. We seek belongingness, but do not find it here. We belong with God in His world, but the "here and now" is where we find ourselves. We are people of faith in a faithless world. We know truth in a world that doubts there is any. We cling to values that are considered, at best, to be passé and at worst to be politically incorrect. We read, cite, sing from, and meditate on a book that has never needed a second edition. We stand in a world full of people looking for the next biggest technical marvel that will solve their problems, but we seek only God. It is no wonder we occasionally panic. We are aliens. We are children of God; He knows where we are and why we are here. He is what is familiar and inviting when the world seems strange. We feel at home, when we feel His presence. We should not be surprised when, as people of faith, we stick out like a sore thumb. We should not be surprised others do not understand us, our words, our actions, or our attitudes. When God shines through us, we look as strange to others as the world feels strange to us. When you feel like an alien; take heart. When the world gives you a funny look; be encouraged. When you feel like you are in the wrong room or the wrong life; know that you are God's child and His purpose for you will unfold. Even if you are in the wrong room. By the way, if you should find you have a kidney stone, take my advice and DON'T do a Google image search. You may find this.